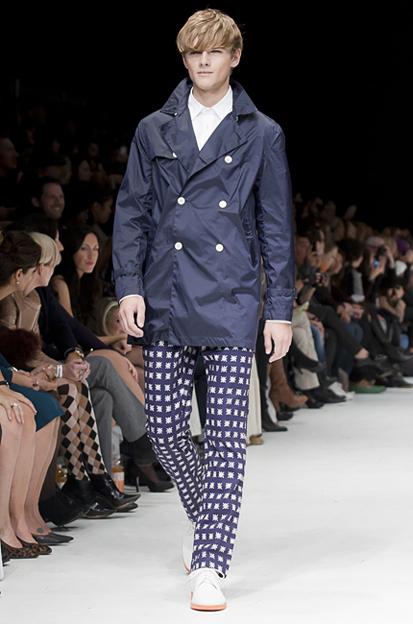 In honor of Toronto Fashion Week wrapping up last Friday and at the behest of a loyal Canadian follower, I decided to turn my sights north and review the Spring 2012 collection from Joe Fresh. With the brand opening its US flagship store on Fifth Avenue this month, the Canadian retailer is taking America by storm. Joe’s line, designed by Joe Mimran, offers incredibly chic and trendy clothing at affordable prices. Think H&M but better. The Spring 2012 collection is no exception. This season’s line is almost a perfect checklist of every major trend. It’s got bright colors, bold prints, and white solids as far as the eye can see. 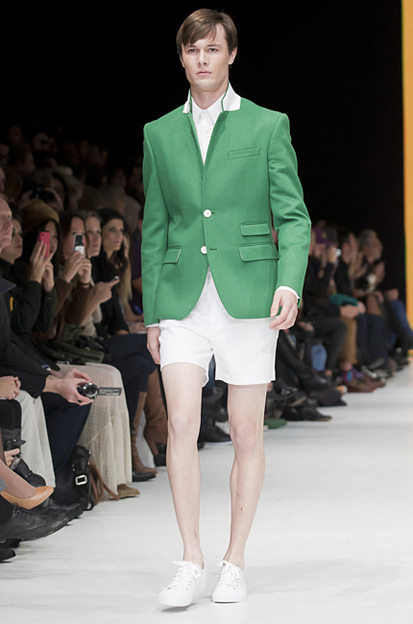 I’m loving the blazers paired with shorts, a combination we saw time and time again on spring runways. 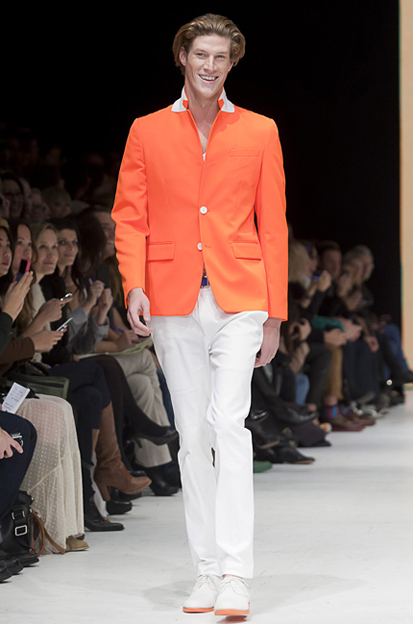 Orange, tangerine tango to be exact, took center stage, appearing prominently in jackets and pants and accenting the soles of classic oxfords. As Joe Fresh plans widespread expansion into the American market, expect to hear much more about the Canadian retailer. This jacket is the color for spring and the perfect open to the collection. The trench is great. The pants are amazing. 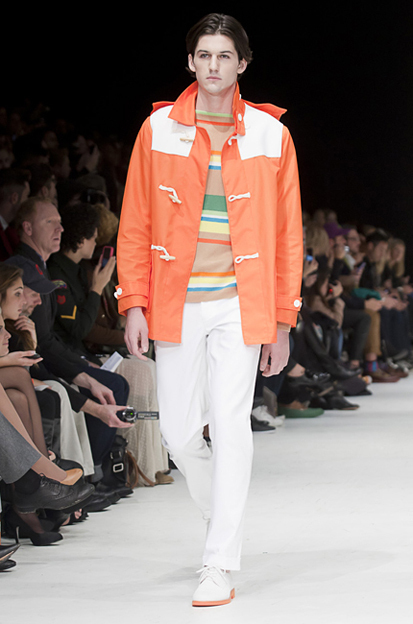 The toggle jacket is a flawless convergence of two trends: nautical and color. Neutrals, clean and simple, can be incredibly chic, too. 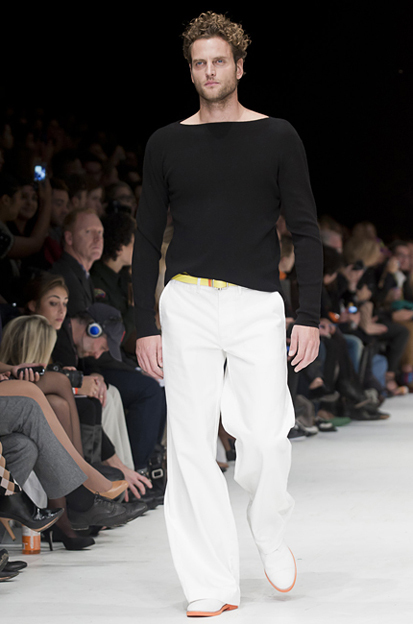 These white pants are loose fitting and accented by a belt that perfectly pops. 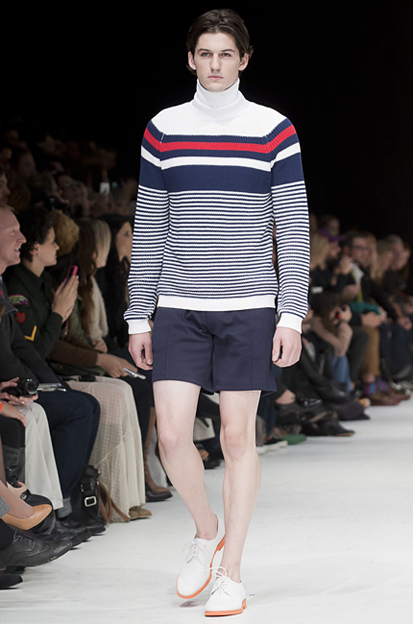 There’s no endorsement I can offer for nautical that this look can’t argue better. Green was another big color story of the season. This yellow is anything but mellow. 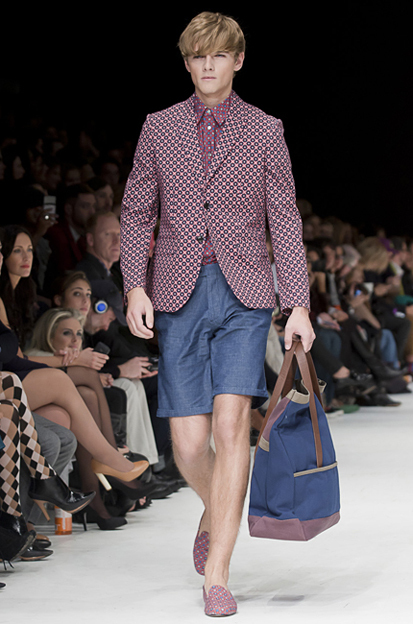 This is by far my favorite printed blazer from the collection. I hope it comes with the matching loafers. 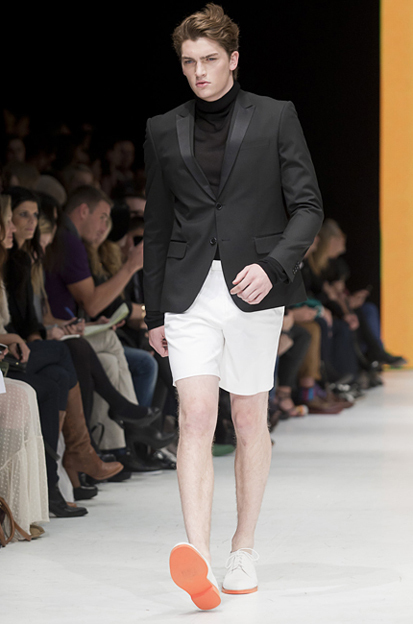 If you learn nothing else from Joe Fresh, at least swap out your suit pants for a great pair of shorts. 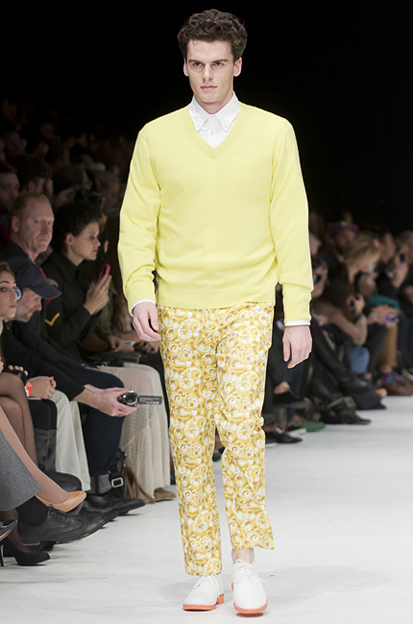 A ticket to the next Joe Fresh runway show (or any of Toronto Fashion Week) would be amazing. Hint. This entry was posted on March 20, 2012 by The Modern Minion. 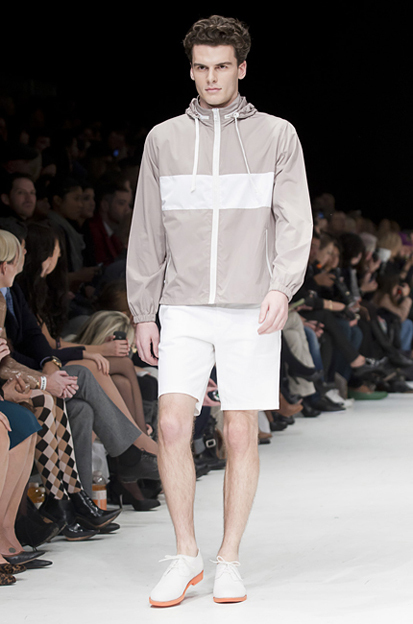 It was filed under RUNWAY, STYLE, TRENDS and was tagged with color, fashion, Joe Fresh, men's fashion, menswear, runway, Spring 2012, style.